No, we did not nip off to the Pacific Northwest. This was the view this morning in Griffith Park. Quite different, isn’t it? 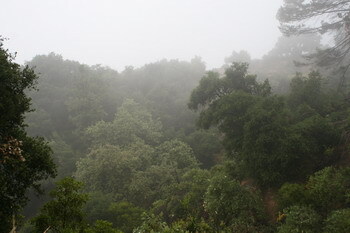 Yes, June Gloom, our seasonal friend – but today with a new and special feature: Drizzling rain. Too good an opportunity to pass up, perfect for a hike up to the Observatory. Who knows when we will see rain again?